If you ever bought a second hand lens you probably know that one of the first things to do is to look through the lens and check for fungi. 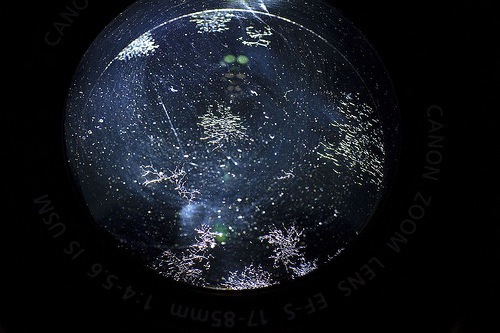 See that image above, it’s a fungi infested lens! It is there to serve the same purpose as the picture of the decaying tooth lady in the dentist’s office – Don’t let this happen to you. The most crucial thing about not getting fungi on your lens is to keep it dry. Not just dry-in-a-dry-cabinet kind of dry, but dry-like-the-desert kinda dry, since any humidity in the air (especially in a dark closet) can convert your lens into a make-shift dish. It should be obvious why fungi is bad for your lens, but I am going to tell you why anyway. 1. Aside being kinda gross, fungi clutters the optical path in your lens and therefore kills some of the quality of the lens. Left unattended the fungi will spread to consume more and more space rendering the lens semi opaque. Now, that would be a really crappy lens, wouldn’t it? 2. Unlike us humans who eat food and dispose waste, some fungi eats… well.. whatever fungi eats. and dispose acid. This acid can burn the coating on the inner glass elements on the lens, so even if the fungi is removed the lens is still damaged. Bummer, right? Luckily, the solution is quite simple. 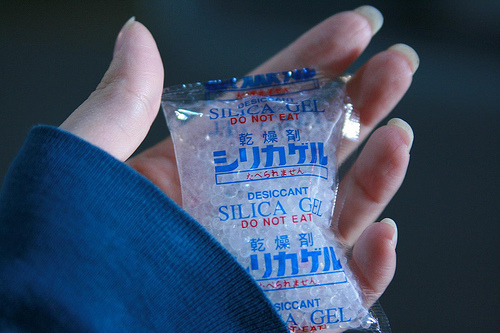 Silica Gel is the substance in those little paper bags that look like coffee-sugar-bags that you find in shoe boxes or coats nylons. They are there to absorb humidity. Luckily you can get silica gel packets for really cheap and place them in your lens drawer (or your other lens-organizing-device). 2. Reusable, you can get them back to the dry state by applying heat for a certain amount of time. Don’t get fungi on your lens, really. It is really hard to remove, and aside from sending it to the pro, there is nothing you can do. (and also sending it to the pros won’t always work. Keep your lens storage dry!